We’re celebrating 10 years of partnership in Accra, Ghana! 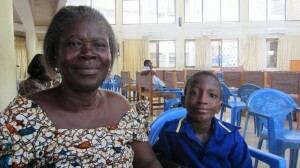 Our partner, Korle-Bu Teaching Hospital, has provided treatment to 1,748 children and adults in the last 10 years. As of the end of September, a total of 8,010 interventions including 779 surgeries have been completed. The interventions include: speech language assessment and therapy, audiology, counselling, feeding and nutrition support, and dentistry. Travel costs are also compensated in some cases. Based on home visits and interviews with parents, the project has shown to improve the quality of life of its patients. Children are often better accepted within their societies and are now attending schools. Our partner also advocated on behalf of cleft patients to have cleft lip and palate included as a functional impairment under the National Health Insurance Scheme, a form of national health insurance established by the Government of Ghana. This insurance provides access and financial coverage for basic health care services to Ghanaian citizens. Previously, cleft lip and palate was viewed as a cosmetic procedure and was not included in the insurance scheme. Thanks to the hard work of our partners, some of the aspects of cleft-related procedures are now covered. Generally for most patients, the closure of the lip is of primary importance. The project faces challenges in follow-up with former patients because contact information often changes or patients are not enthusiastic about further long-term treatment. The team hopes to educate parents about the important role of follow-up, revisions and constant contact. TF has undertaken an internal 10-year review of the project in order to guide our future efforts in Ghana and allow us to expand our reach to new areas. Stay tuned for more information as we continue to close the gap in cleft care in Ghana!